By Peter Anderson 9 Comments - The content of this website often contains affiliate links and I may be compensated if you buy through those links (at no cost to you!). Learn more about how we make money. Last edited September 26, 2011 . Lending Club has been around for a few years now, and while they and other P2P lending sites got off to a rocky start, I think they've started to hit their stride. Lending Club recently announced on their 4th anniversary that they have now originated over $300 million in total loans and paid out over 22 million in interest to investors. So they're no longer the little engine that could, they're now becoming the next big thing! Still, there are still those who don't believe in P2P lending, mostly because they don't completely understand it. When I started lending with Lending Club I wasn't sure what kind of returns I would see, and as such I was pretty cautious with who I lent money to. I was only investing with Grade A and B borrowers to begin with. Since then others have convinced me that investing with some lower grade borrowers is a sound idea, and I've seen my returns grow from somewhere in the high 8% range (not too bad) to the point where I'm now pushing 11%. 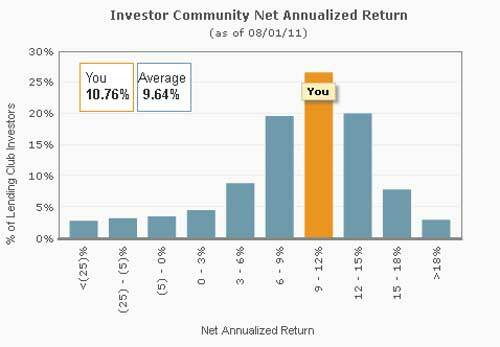 All I know is 11% net annualized returns are a lot higher than I'd be getting in a high yield savings account. The longer I've been using Lending Club, the more comfortable I am with the idea, and the more money I'll consider putting in. So how are my Lending Club investments currently doing? Here's a snapshot of my account from earlier today showing that my returns are pushing 11% now. Fourteen loans have been paid off early: Eight were A grade loans, and the other three were C grade loans, two were grade B and one grade E. Looks like grade A loans, while they're more likely to be paid back, may also be more likely to pay of early – reducing returns. 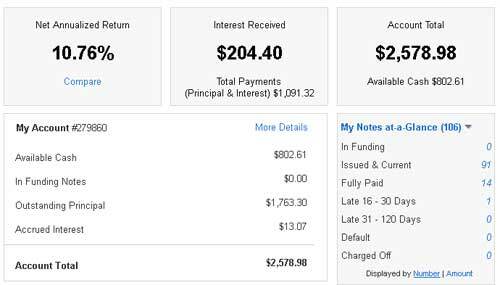 My account balance still going up: I currently have $2,578.98 in my account, with another $800+ ready to invest. I'll be the first to admit that the last couple of months I haven't added many loans as I've been distracted by other things. I'll probably be trying to invest that extra $800 soon though. I’m still diversified by investing across a large number of loans: I've got 106 loans, with no more than $25 in each loan. That way if I do have defaults, while my return may go down, my risk will be minimized. Lending Club noted earlier this month, that 100% of their investors who have invested 800 notes or more had positive returns. Not too shabby, not everyone in the stock market can say that! So it looks like my strategy I laid out a few months ago of adding more risky C, D and F grade loans is paying off so far. I mentioned a while back that I was changing my Lending Club investing strategy and starting to invest in more higher risk lower grade loans. The rationale was that you can still find people that are relatively good risks, but who have bad credit. Most of these are going to be loans from people who have high incomes and steady employement, but for one reason or another have had a hiccup in their credit causing them to be lower grade. I've invested in a bunch of these Grade C-E loans over the past year, and since doing so my returns have steadily climbed. I would have expected to see a few defaults in there, but so far I've been investing in the riskier loans for about a year now, and none of them have defaulted yet. Would you think some of them will still default despite my early success? Possibly. But I'm hoping my gamble on those with steady jobs and high incomes will mean I wont' see many defaults. Here’s where my NAR stands now, getting better every month. Now standing at 10.76%. I'm hoping I can break through that 11% threshold next month! Here's the basic strategy I've been using with Lending Club over the past couple of years. Borrower answers to investor questions: Because of privacy and liability concerns you can no longer ask whatever question you want from borrowers, but only ask from a pre-set list of questions. It's still good enough for me I think, although I'd prefer being able to ask specific questions. My Lending Club returns have continued to increase to the point where they're now teetering on the edge of 11%. Here's how I've done it. Last Edited: 26th September 2011 The content of biblemoneymatters.com is for general information purposes only and does not constitute professional advice. Visitors to biblemoneymatters.com should not act upon the content or information without first seeking appropriate professional advice. In accordance with the latest FTC guidelines, we declare that we have a financial relationship with every company mentioned on this site. I haven’t used Lending Club, but I’ve been following your results. Once I top out my Roth IRA I may turn to Lending Club to do some investing. It looks promising! Congrats Peter great work. No defaults yet? Pretty impressive. How many months or years have you been doing this now? For others interested, I also discuss about Lending Club on my blog and how to get decent returns. I’ve been doing it for just over 2 years now.. I’ve had 3-4 loans that went late, but thus far all have caught back up on their payments..
Looks like I use about the same criteria as you. It’s been working very well for me, too — $2500 invested for six months and no defaults or late payments, even with a higher average risk than your portfolio has (net ~14.5% return). One thing I’d add is that I give great preference to debt consolidation loans or similar, as that shows me a person is making a smart financial decision. If a D or E grade debt consolidation loan matches my other criteria, I would be fairly eager to invest. On the other end of the spectrum, I’ve seen F grade loans for new motorcycles, swimming pools, and certain elective medical procedures. If you really think you need these things even at 22% interest rates, you should probably reconsider your definition of “need”. Any way of pulling your $$$$ out once you get them in loans? Lets say I am looking to buy a house in a year…or do you need to keep the $$$ in for the term of the loan? If you do take your $$$ out is there a fee? Sounds like a quality investment & a great business idea. I haven’t had to do that yet Chris, but I believe the only way to do that would be to sell your notes on the lending club note trading platform. Others who are more knowledgeable about that may be able to chime in. Congrats, you’re doing real well. How old would you estimate your average note to be? One small detail……….you’re currently invested in 92 notes, not 106 as you stated. The 14 notes that were paid off early remain part of your history but are no longer part of your holdings as the notes are at zero balance.